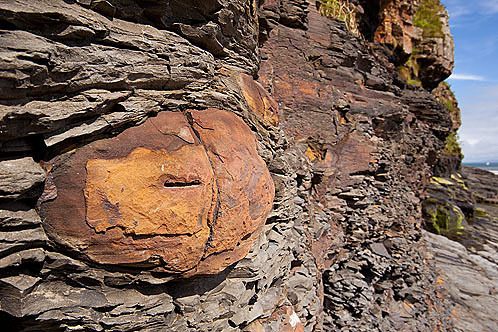 Clay Ironstone Nodules , in the cliffs to the east of Amroth Beach . A hard clay-rock , containing carbonate of iron (chalybite) , interbedded with shales associated with coal seams in the "Coal Measures ". Normally the colour ranges from light to dark brown but it may be almost black, due to the presence of so much carbonaceous matter that the ore can be roasted without the use of fuel.